For a few months now I have been keeping something exciting and very dear under wraps. 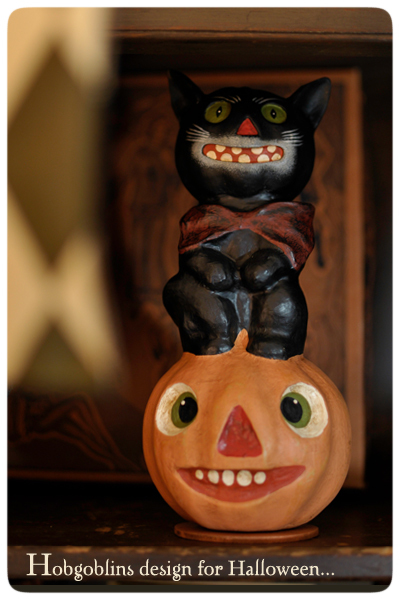 But, now with fall fast approaching, it is time to let that cat out of its bag! And the scoop is that I am honored to be a style contributor for AUTUMN with Matthew Mead Magazine! Thanks to the magical web of Facebook and a shared passion for Halloween, Matthew and myself connected and became friends. 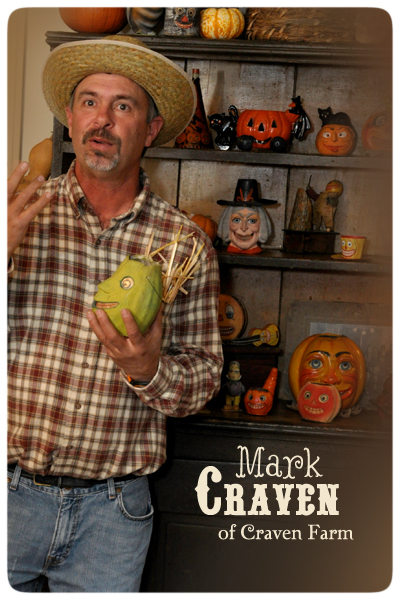 I quickly realized that he was an admirer of my Halloween folk art and I too of his Halloween themed articles, projects and books that he is certainly well known for. When my mom learned of this new friendship, she began to scheme and dream as she (and I) often do. 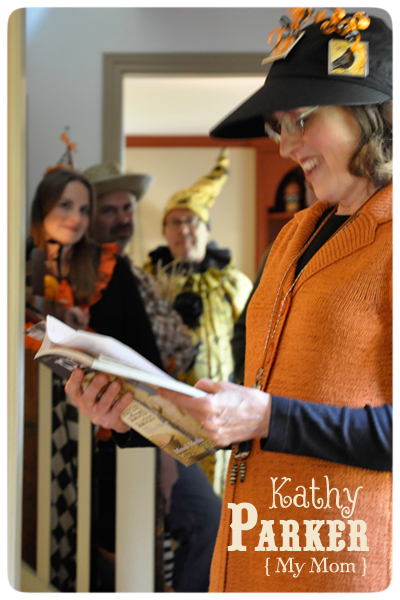 Scheduled on her fall calendar was a fantastical Halloween event she promised to host within the decorated walls of her colonial style home. 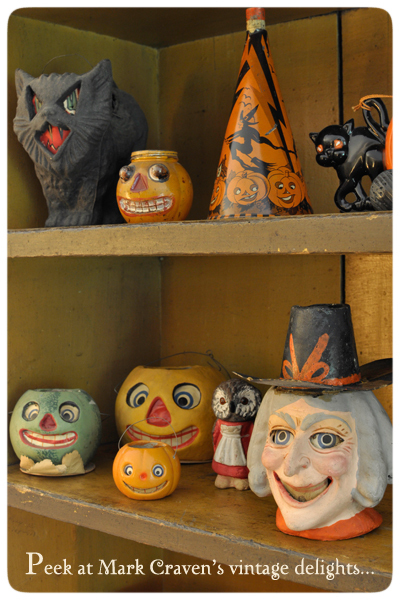 It would be a gathering of like-minded souls, sharing a passion for all things October 31st with an emphasis on collecting. 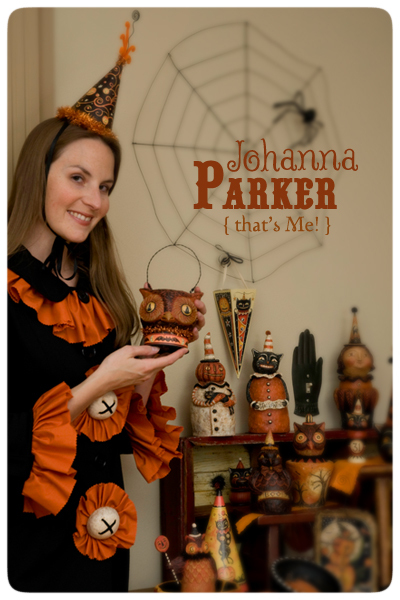 I was to be one of the 3 surprise guest speakers presenting Halloween delights to the Country Collectors, a long-standing group of Washington-based friends that collect antiques and the like.... But, besides hosting the event, the idea to document and publish this one of a kind day began to haunt my mother, and naturally, she began to haunt me! After mom had convinced both myself and JP to fly out for this unique experience, she charmed the hearts of both our friends, Bruce Elsass and Mark Craven to join us in presenting to the group. 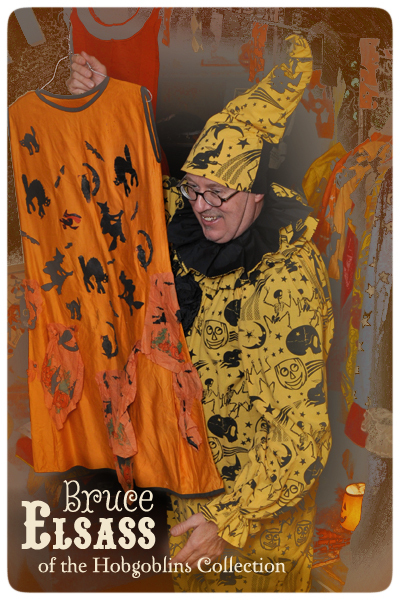 With Mark's prized collection and knowledge of vintage Halloween novelties, Bruce's vintage costumes and current product designs and my Halloween folk art collectibles, it made for a well-rounded group of Halloween hot shots! And with everyone on board, we were destined to create a very noteworthy day. Fortunately, Matthew Mead was also intrigued by the idea, so with little time to spare, it was up to us to capture the moment! I am happy to report that mom's dream truly did become reality! And, if you ask any one of the guest collectors in attendance, they would tell you that it was a magical day indeed. Eyes were bright with delight, while laughter and smiles filled the home. 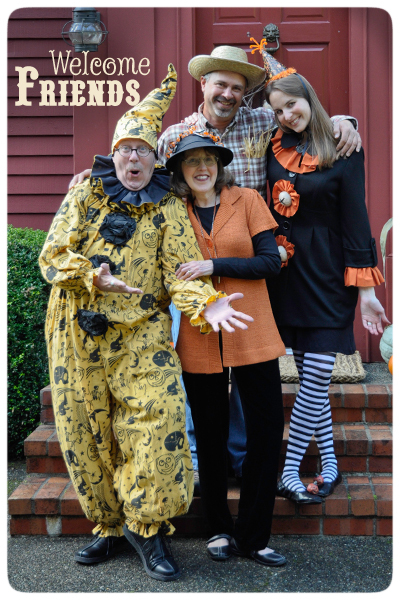 The happy spirit of Halloween was ever present, and the day was truly a treat for all. JP and myself spent countless hours photographing the decor, displays, the food and the presentations in hopes that we could indeed document the event for the opportunity to share it with Matthew's readers. And guess what? That opportunity will soon be here! Matthew and his design team are putting the finishing touches on his Autumn issue as I type. 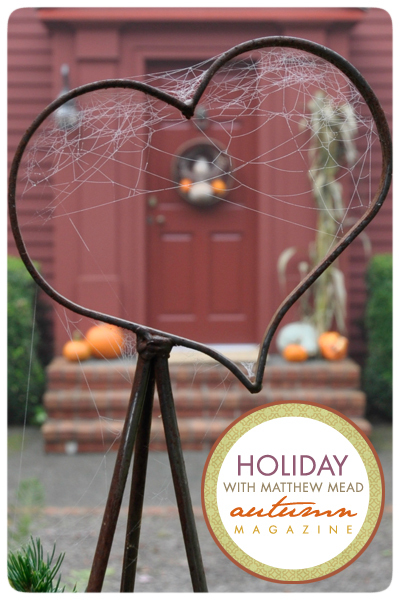 The only way you can enjoy his fall issue for yourself is to order your copy directly from Matthew's Website. This Autumn Holiday is destined to be a collectible book-azine as its his last self-published edition before he hits the newsstands with his winter Holiday issue up next! So, I suggest that you order your copy now before they sell out, as numbers are limited. * We filled one of mom's antique cupboards with just a sampling of Mark's vintage collectibles from his astounding collection of over 3,000 pieces! * On the opposite side of the room, we loaded on old corner cupboard with the various delights that Bruce Elsass brought with him, all the way from Connecticut! Here stands one of his latest vintage-inspired Halloween figures from his product line, destined for the mass retail market. 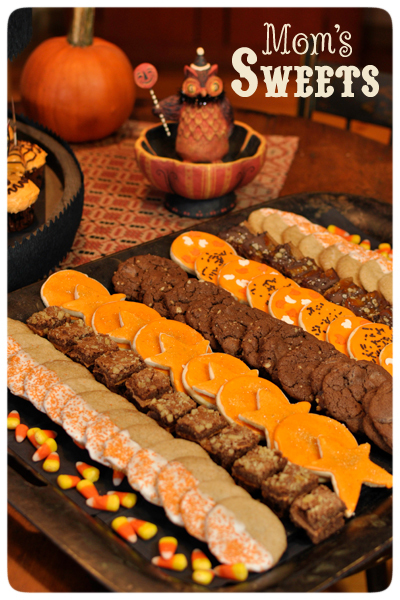 * In the dining room, Mom had harvest tables and sideboards filled with edible delights. 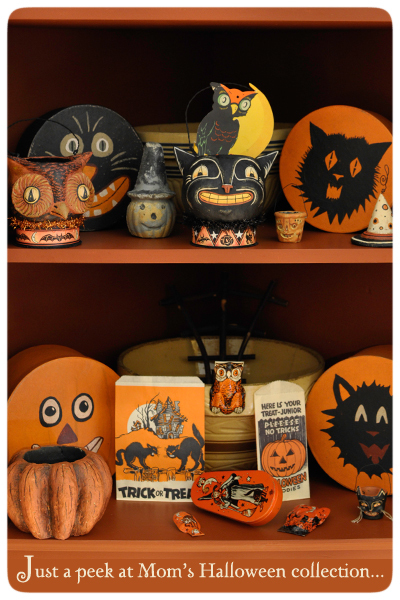 In this space, she also filled a corner cupboard with some of the items from her own Halloween collection. Can you spot some of my reproductions? So, would you like to see and read lots more about this memorable day? 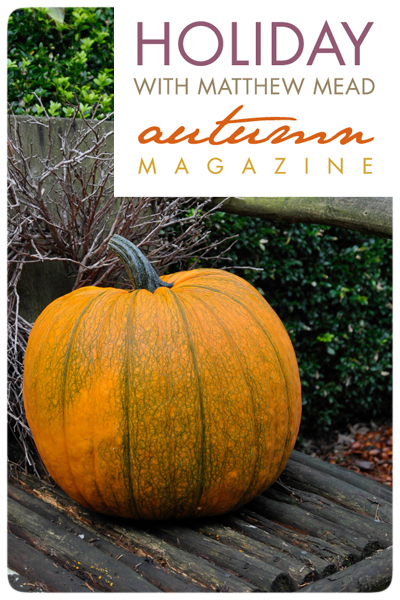 Then, order your copy of AUTUMN with Matthew Mead Magazine!